These huge statues (19.5m), are the only part of the ancient mortuary temple built in Thebes by Amenhotep III (18th dyn) that remains today. Several floods have wiped out the other ruins of this temple. Ancient Egyptians called the southern of the two statues "Ruler of Rulers". The statues are made from carved blocks of quartzite quarried either at Giza or Gebel es-Silsileh. 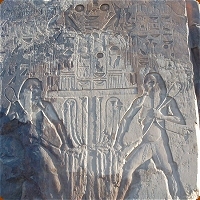 The Northern statue depicts Amenhotep III with his mother, Mutemwia, while the southern statue is of Amenhotep III with his wife, Tiy and one of his daughters. 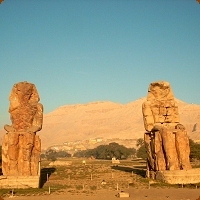 These statues where called the Colossi of Memnon in Greek times, when they decided that the colossi represented their hero, memnon. He was a king of Ethiopia son of the dawn god Eos, who died in hands of Achilles. After an earthquake in 30 bc, one of the statues produced a musical sound under certain weather conditions. To be granted a song meant that you were very much in favour of the gods. Visitors came from miles around to hear the music, including Emperor Hadrian, in 130 A.D. Egyptians thought this sound came from the gods, and Greeks thought it was Memnon's voice. Unfortunately a Roman emperor Septimius Severus, repaired the statues in 199 AD, and since then the sound has never been heard again.